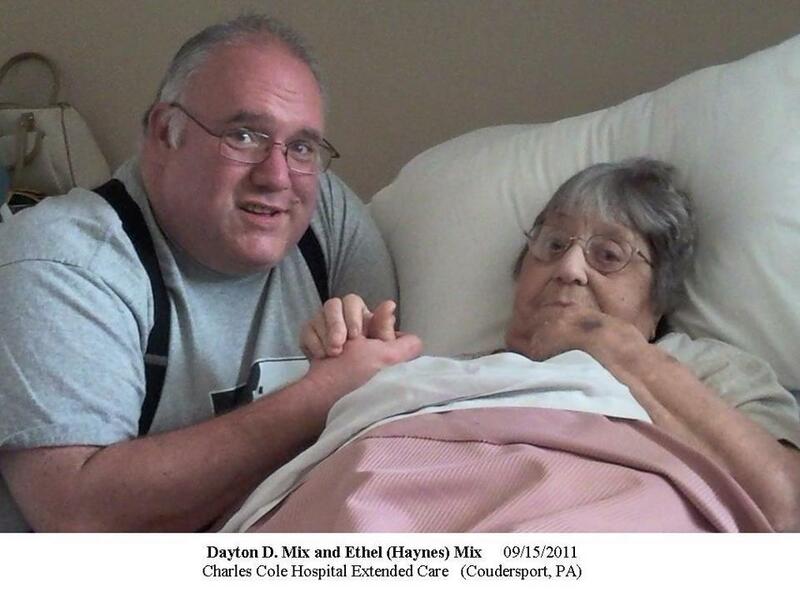 Today, June 27, 2012, was the funeral for my grandmother, Ethel Pauline (Haynes) Mix. The pastor at our home church, The Rev. Rebecca Edwards, officiated the service while I preached the eulogy. These were my basic notes. These are speaking notes, so grammar wasn’t my concern. And as always, I can spell pretty well, but am a lousy typist, so be gracious! When we want to honor someone who has lived their life and then died, we highlight the year they were born (and for Grandma that would be 1918) and then put a dash followed by the date they died (2012 in our example). Seeing those dates, 1918-2012, are supposed to help us understand how long and blessed a life the deceased was able to live. There is a great poem that talks about how that dash in between those two dates is such a poor summary of an entire life, and it challenges us all to live our lives in such a way that our ‘dash’ has great meaning. But this morning, it’s those two dates that really capture my attention. Ninety-three years! Almost a century! an evening gown went for about $37.00. a ticket to a Broadway show would set you back somewhere between 75¢ and $2.50. The United States was averaging about $291 million in surplus. World War I, the “Great War” to end all wars, was in its last few five bloody months, ending on November 11, 1918. An influenza epidemic broke out that would kill 25 million people worldwide, 500,000 in the U.S. alone. Life expectancy of a girl born at this time was estimated to be about 54.6 years. It’s that last statistic I want to draw your attention to: A girl born in 1918, it was calculated, ought to be able to live until about their 54th birthday before they died. Grandma REALLY beat the odds! By about 4 decades! I remember back in 1982 that Grandpa Mix worked with the rest of the family to pull off a surprise 45th wedding anniversary party because no one expected Ethel Mix would still be alive 5 years later for their 50th anniversary! This past Saturday Grandma Mix saw the 75th anniversary of their wedding day! And Grandpa has been gone 18 of those years. Time and time again, we thought Grandma was going downhill and maybe it was time to rally the family. And every single time, until this last week, she beat the odds and, as Aunt Bonny remarked at one point, Grandma was like the Energizer Bunny!… STILL GOING! In the book of Ecclesiastes, chapter 3, we read, there is a time to be born, a time to live… but we also read that God has also established a time for death… a time when each of us will die. For Ethel Mix, that God-appointed time came early on Sunday morning, June 24th, 2012. How do you gather together the essence of a life well-lived? You know… I’ve heard that song on Gaither videos, but I had to go look it up. There are four verses to that old hymn. Each one speaks of another realization of what Heaven is like after each of us dies… and goes Beyond the Sunset. “Beyond the sunset, O blissful morning, when with our Saviour heav’n is begun. This first verse talks about those first few moments of a Christian “waking up” in heaven and realizing that our life here on earth was just nothing compared with the time of eternity in Heaven with Christ. Waking up and realizing that all of the work and struggle of this life is now gone… and an eternity of rest and joy awaits those who know Jesus as Lord. Nothing will be the way it was here in this life. No more Hopelessness… just Hope fulfilled! Bliss! Joy! The beginnings of your life in Heaven! O day of gladness, O day unending, beyond the sunset, eternal joy! I can see the attraction for Grandma in these passages… She was born before the Great depression and had a sense of what ‘normal’ was like. But shortly after her 11th birthday, everything that could go wrong did. The stockmarket crashed. People began to know what it meant to have to do without. When she and Grandpa married in 1937, they were still in the depths of the Depression. This woman had learned how to save that which was precious… You couldn’t take it for granted that you’d have everything you needed down the road… so you’d better save some. As a kid, I loved going to Grandpa and grandma Haynes’ general store because they had SO MUCH of anything you could possibly want or need. But going to Grandma Mix’s was almost like being in that store. She literally stockpiled food, supplies, and necessities… just in case. Most of us in this room that were ever in her house (and especially those of us who helped move Grandma out of her apartment or before that moving Grandpa and grandma off the farm) knew that part of Grandma… there were cans and cans of food that had been saved “just in case” (to the point where they had outlived their expiration date by years and sometimes even decades). Grandma knew that dimension of life here on earth as well, didn’t she? The loss of babies, the pain of losing a son to cancer in his 20’s, caring for him and later both Grandpa and Grandma Haynes as they approached the end of their earthly lives, and then Grandpa Mix in 1994. And the promise that neither of those go with you into Heaven, warmed her soul and spirit with expectation. No more clouds, no more tears, no more fears… just gladness and joy. Ethel Haynes Mix knew that God Almighty had given us a written record of what we could expect and what we could look forward to… and she trusted Him and His record. One of my favorite memories is still being there when Grandpa, Grandma, and Aunt nancy would be sitting in the living room and Grandpa would open the Bible and just start reading. It’s like the Bible was the letter of introduction to the Heavenly father, helping her understand what she could expect. Beyond the sunset, O glad reunion with our dear loved ones who’ve gone before. In that fair homeland we’ll know no parting-beyond the sunset for evermore! 6 And he also said, “It is finished! I am the Alpha and the Omega — the Beginning and the End. To all who are thirsty I will give the springs of the water of life without charge! 7 All who are victorious will inherit all these blessings, and I will be their God, and they will be my children. The song speaks of the “glad reunion” with “dear loved ones who’ve gone before” and the joy that there will never again be a separation for those who know Christ. The apostle called it the “finishing” of all that was before. This woman we called “Mom” or “Gramma” or “M&amp;M Gram” knew what she could expect… and longed for that day. But she also longed to come to the end of all things, beyond the sunset, and find her family there with her at the end of their journey. She knew the joy and expectation, but she also wanted to be surrounded by her loved ones. You know, the Bible’s pretty clear on that as well… for any who REPENT of their sins and trust in Jesus Christ as Savior and Lord, we too, will find our place where grandpa and Grandma now are… beyond the sunset. God won’t force you to go there. As sinners none of us can get there… but of we give up our sin, then we will find that welcoming presence when our days end guiding us to God… and the glad reunion this woman before us is now experiencing.